It’s estimated that almost a quarter of all Duolingo users are resident in Ireland. 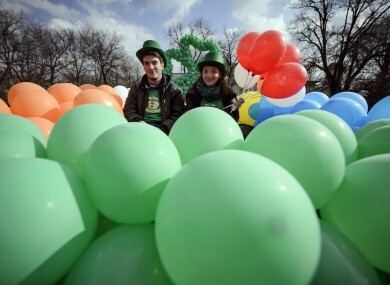 A couple poses during the St Patrick's Day parade in Bucharest, Romania. OVER THE PAST two years, over 2.3 million people downloaded the language app Duolingo and chose Irish as a language they wanted to learn. Today, President Micheál D Ó hUigínn will recognise the seven volunteers behind the Irish language course on the app – including a fifth year secondary school student from Cork, who began the project when he was in third year – for the work they’ve done in building up these users at a special ceremony at Áras an Úachtaráin. Duolingo has over 150 million users registered to its service which has 87 languages to choose from. The app is the most popular language app available because of the simplicity of its lessons. People who had to take Irish in school but didn’t manage to learn the language and now regret not having learned it as an adult. This is more common than one might think. Heritage learners. As has been said, the Irish diaspora around the world is huge… Many, many, many families did not leave willingly, and some of those families have kept very close ties over the years – my family is one of these. Parents living in Ireland who want to be able to help their children with their Irish homework, whether those parents are Irish-born and raised (and thus have some exposure to the language) or came from elsewhere (and thus have little or no prior knowledge). This is something that Aodhán Ó Deá, director of development in Conradh na Gaeilge, agrees with, but also says that it’s down to a number of factors. “There’s been a growth in all kinds of language courses this year – from the ones Conradh na Gaeilge offer, to the summer schools, to Gaeltacht courses. “The thing I hear again and again from people is ‘I’d love to learn the language’, and I wish I learned it in school’. It proves that there’s still a huge interest in the Irish language, despite all the negative coverage it gets. There has also been an improvement in Duolingo’s service itself. The language app began as a game and has gradually moved towards a more course/classroom oriented system. The language app teaches vocabulary, grammatical tenses, and gives aural tests with a practical approach in mind. It’s also free of charge, and crowd sourced in a very loose interpretation of the term: users can upload new terms to be included in future updates of lessons. The language app is a social as well as a learning tool – people can monitor their friends’ progress, partake in forums around languages (which are very civilised) and share results of various tests with each other. Oisín Ó Doinn, Irish Research Council Scholar, and one of the contributors to the Duolingo Irish course says he’s delighted so many people have benefitted from this free resource. “In the four years since we launched Duolingo, we’ve launched 87 different courses to provide free language education for over 150 million learners. Email “Over 2.3 million language learners have signed up for Irish lessons on Duolingo”. Feedback on “Over 2.3 million language learners have signed up for Irish lessons on Duolingo”.